Like many other Norwegian families, the Olafsen family decorates the house for Christmas on “Little Christmas Eve”, 23 December. (Photo illustration: ThorNews). Christmas Eve is one of the highlights of the year, especially for the youngest members of the family. When the Church bells ring at 17:00 on Christmas Eve to signal that Christmas has arrived and families have gathered around the dining room table, the day has already been filled with many traditional tasks. The holiday season has been prepared for weeks (some start early October): Christmas cookies have been baked, meals planned, presents wrapped, the house cleaned from basement to loft, the Christmas tree is decorated and shirts and dresses have been ironed. Christmas Eve 2017 will be celebrated by the Olafsen family from Nordland in Northern Norway exactly the same way as in 2016, and quite similar to how many Norwegian families celebrate the holiday season. 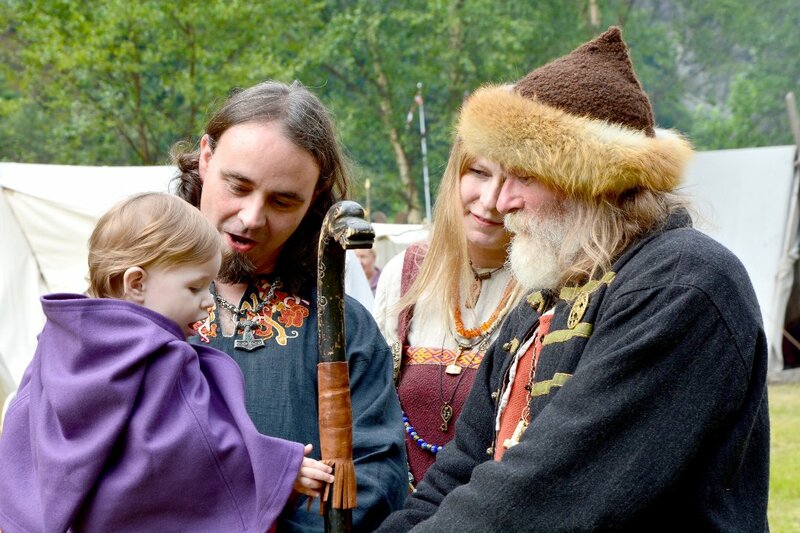 The family consists of mom Ingvil (32) dad Tormod (41) and the twins Ask and Embla (9). The family spends Christmas with grandma Marie (63) and grandpa Lars (65) in the grandparents’ home. Ask and Embla have been outdoors making snow lights together with grandpa. The candles are lit at about 16:00 (there is daylight only a couple of hours this far north). The children and grandfather have hung up an oat sheaf in the old birch tree. “Tre nøtter til askepott“ (Three Wishes for Cinderella, Czechoslovakia 1973) and “Reisen til julestjernenen” (Journey to the Christmas Star, Norway 1976) are among the favorites. Journey to the Christmas Star – Sonja’s Song, 1976. Grandma and mom Ingvil have been visiting the cemetery where they have lighted candles on the graves of their relatives. Christmas porridge made by dad is served for lunch (grandmother is preparing dinner with mom): risengrynsgrøt (rice porridge) topped with sugar and cinnamon, and a dab of butter in the center. Grandma’s homemade raspberry juice is served to drink. There is hidden an almond in the porridge, and the one who finds it wins a marzipan pig. The children always win, and this year Olaf finds the almond. Ask and Embla are allowed to open two presents. The waiting time feels really, really long before the Christmas presents will be handed out. Grandma is responsible for the dinner served exactly at 17:00. The Olafsen family has always eaten ribbe (roasted pork belly) served with sauerkraut, boiled potatoes, sausages, meat balls and gravy. It is important that the ribbe rind is crispy, something the adults always comment during the Christmas dinner. Grandpa and dad Tormod organizes drinks: juleøl and akevitt, and julebrus (Christmas soda) for the children. Grandpa and dad set the dining room table under guidance by grandma. In many Norwegian homes, it is tradition to set the Christmas Eve dinner table for one extra guest, “The Uninvited Guest”. This is also the tradition in the Olafsen family. Many Norwegian families attend the traditional Christmas service in their local church. The Olafsen family follows this year’s Christmas service listening to the radio in the kitchen. Because of the children and the Christmas dinner, they have chosen to listen to radio instead of watching TV while preparing the evening. In 2017, the traditional service is broadcasted from the Lade church in Trondheim. Everyone in the family change clothes for dinner. The men are wearing a suit and tie, the women a Christmas dress – and jewelry they only wear on Christmas Eve. The Olafsen family members find their seats around the set table in the dining room. Grandfather fills up the empty glasses. Grandma and mom have put the hot Christmas ribbe (roasted pork belly) and the accessories on the table, and it smells heavenly. Church bells can be heard ringing from the TV turned on in the living room, and Sølvguttene (“The Silver Boys” boys’ choir founded in 1940) welcome Christmas with their sacral voices. Grandpa is standing up and says “God Jul!” (Merry Christmas). “God Jul!”, all in the Olafsen family answer and the Christmas season has officially started. Food is sent around the table while the family listen to Sølvguttene. The adults enjoy the food and there is a ceremoniously atmosphere. Grandpa makes sure the glasses are filled up. The children think the dinner takes too long and can hardly wait until they are allowed to open the Christmas presents. Grandpa tells an old joke, laughs loudly, and fills up his akevitt snaps glass one more time. Dinner is finished, the adults clear the table. The children play with the toys they got earlier in the day. ”Et barn er født i Betlehem” (A Child is Born in Betlehem), and..
Musevisa (The Mouse Song), by Norwegian National Poet Alf Prøysen. Grandpa says he has to go outside to pick up something he has forgotten in the garage. The front door bell rings and the children are asked to open. It is julenissen (or nisse(n) for short, the Norwegian version of Father Christmas) bringing a sack with one present to each of the family members. Embla whispers to Ask that nissen smells akevitt, and that she knows that it is grandpa. Mom assists nissen handing out the presents by picking the gifts out of the sack. She has to read what is written on the gift tags because nissen cannot see anything without his glasses (that he always seems to forget). Christmas presents placed under the Christmas tree are also handed out. Ask thinks it is sad that grandpa is out in the garage just when nissen visits the family, just like last year. Julenissen asks if the children want to sing a song. Ask and Embla is sitting on his lap while they sing “På låven sitter nissen” (In the Barn Sits Nissen). Julenissen leaves the Olafsen family after having drunk a small glass of akevitt. Grandpa is back and says that he did meet nissen outside, just before he left heading for the next family in the neighborhood. Presents are opened and dessert is served consisting of multekrem (cloudberry cream – the majority of Norwegians eat risengrynsgrøt, but the Olafsen family has always preferred multekrem) and krumkaker – one of seven types of cookies that is a must-eat during Christmas. Coffee and brandy, and julebrus to drink. Mom Ingvil and dad Tormod agree that also this year there are too many presents for the children, and that some have to be opened the next morning. Ask and Embla play with the presents. Dad comments. like last Christmas Eve, that julenissen must remember batteries next year. The adults relax and watch ”A Christmas Carol” by Charles Dickens. Ask and Embla, mom Ingvil and dad Tormod have gone to bed. Grandma prepares the First Day of Christmas breakfast while grandfather has fallen asleep in his favorite chair with a small glass of akevitt in his hand. Thank you! What a lovely and interesting post! what a beautiful post. much appreciated, thor.